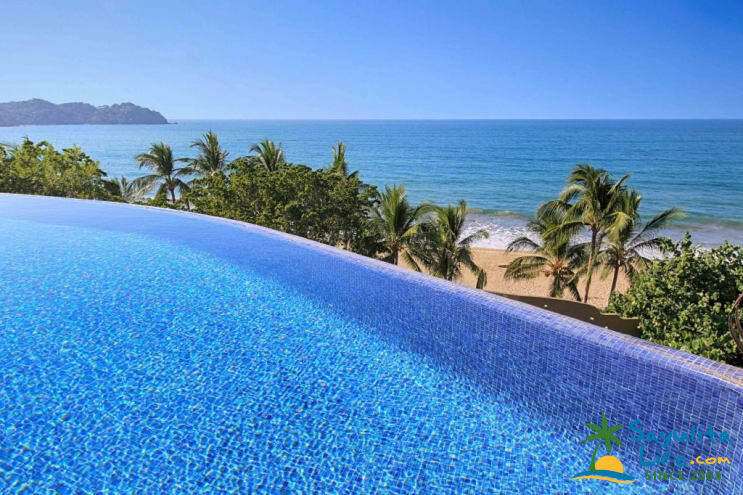 EL PALACIO IN SAYULITA IS A SPECTACULAR, WORLD CLASS DESIGNER HOME WITH 4 BEDROOM SUITES AND 7 BATHS. FOR AN ADDITIONAL FEE, CASA MILAGROS (3 BEDROOM, 4 BATHS) CAN BE ADDED TO FORM VILLA MILAGROS, A 7 BEDROOM 11 BATH MASTERPIECE VILLA EXPERIENCE WITH TWO POOLS, JACUZZI, TWO INCREDIBLE KITCHENS, ETC., ETC. IT JUST PLAIN DOESN'T GET ANY BETTER THAN THIS ON PLANET EARTH. Having a destination wedding or other very special event? Combine both properties for the most exquisite beachfront venue, Villa Milagros Weddings. Experience the magic of Sayulita from a whole new perspective. 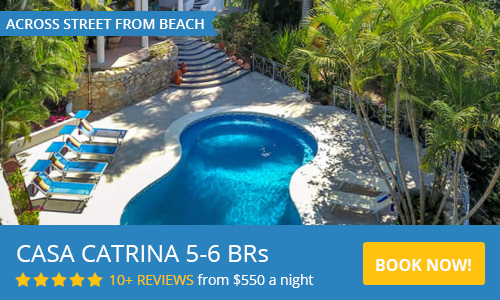 Just completed, with almost 8000 sq/ft of world-class luxury and amenities, “El Palacio”is one of the finest Sayulita beachfront vacation rentals you will find anywhere at any price. El Palacio has the unique distinction of having some of the most incredible views in Sayulita while, at the same time, being only steps away from the most private and pristine end of Sayulita’s beautiful beach. 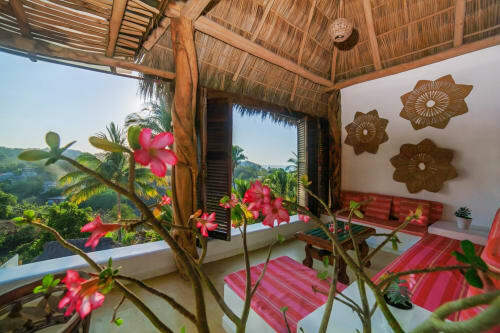 “El Palacio” in Sayulita was hand built by some of Mexico’s most accomplished craftsmen, using only the finest materials and created by designer Rogelio Romaña to be at one with nature, while staying connected both to Sayulita and the world. This fabulous new villa is a study of exquisite contrasts, at once open, cozy, private, connected, laid back, and elegant. 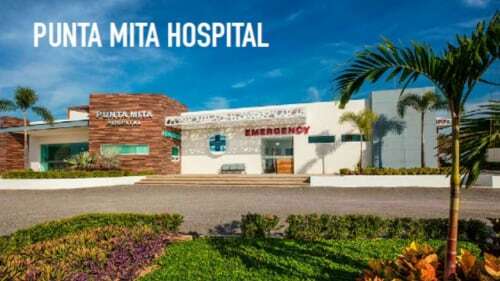 There are few places on the planet that can provide such a unique combination of world-class quality, and small town Mexican charm. World class designer kitchen with Wolf Stove and Oven, state of the art appliances and amenities. Designed for use by professional chefs. This home has been built with effective security in mind – with only two secure ways in and out. Large safe on the premises. Please use the contact form for questions and to request a reservation. Another beautiful and first class beach-front 3-bedroom home with large pool resides on the adjacent property. “Casa Milagros” is a splendid additional option for families or gatherings requiring more than 4 bedrooms. Groups may wish to combine El Palacio with Casa Milagros to form Villa Milagros comprising both houses and offering a total of SEVEN master suite bedrooms and ELEVEN beautiful baths. We rented both houses for a whole family reunion over the Christmas season. 14 people with plenty of space for all. Marcos and his staff have not left out any details! They not only provide top notch service, they are top notch people. His team cooked for us the first night and I highly recommend using this service. Sayulita has plenty of great spots to eat, but the meal at home was memorable! We rented the El Palacio for our wedding in October 2018 and it was just amazing. The El Palacio was so beautify with all the decorations and little details. It was a great location to take some memorable wedding pictures. The staff was amazing, they went above and beyond to make us feel like home. Super flexible and available when we needed them. Great views, wonderful service, down a short hill to the beach, and a short walk to downtown. The house is beautiful. We had breakfast and dinner made by Claudia almost everyday and it was outstanding, from scratch, and always right on time. The owner is always available and goes out of his way to make sure everything is just right. Probably the prettiest place I have ever stayed after traveling the world for over twenty years. Will go back again. Our jaws dropped as we entered this gorgeous home. The artistry and craftsmanship can not be overstated. Then.... there is the view. The staff was thoughtful and thorough in every way. Do yourself a favor and have Claudia cook for you. She is amazing!!! We are three couples who have vacationed together several times and all agree, we felt like royalty. Gorgeous home with amazing ocean view! El Palacio was remarkable! Each day we were delighted by a new detail in the craftsmanship and exquisite details of this home - from the tile work to the local artwork, we were truly amazed. The staff was fantastic as well. Great access to the beach, private, multi-level living so that everyone had their own space but also really great common space for the group to enjoy our time together. Overall a great experience! We rented El Palacio for a week in March (2018) and It was a wonderful experience. Marco the owner, set us all up in the house and made sure we had everything we needed. The staff was wonderful and even though they spoke little english we were able to communicate with them. They made us several meals (and did the shopping) for a very nominal extra charge. The house itself is even better than the pictures if thats possible. We loved being at the end of the beach. Sometimes we would just jump in the Golf Cart (we rented from Roy's Carts) and head down to the beach in town if we wanted more "action". We found some really nice restaurants too. The Wood fired pizza place in town was our favorite. I can't say enough about this awesome house and this sweet little town. We hope to be back some day! We rented both El Palacio and Casa Milagros for 14. The villa was spectacular. The staff was excellent. We couldn't have asked for more. The Views. The Completely Exquisite Accomodations. The Staff. All top notch! We had a group of 81 staying all around Sayulita. Everyone agreed that we had THE place to stay. Beach access. Privacy - on every floor and in every room. Kitchen is well stocked. All bathrooms are designed in a way that you wish they were in your own house. Five stars and more for everything at Villa El Palacio! We stayed at El Palacio for a week in February of 2018. It has everything you could ever dream of in a villa! The interior design is stunning. The views are amazing. The rooms are comfortable and private. The kitchen is state of the art. The location beats anything in Sayulita. A couple of minutes walk to the beach and a five minute ride in a golf cart to downtown. Nice to be away from the noise and just hear the waves rolling in during the night. We enjoyed being spoiled by the staff who cooked several meals for us -- delicious food. The great room on the third floor can easily accommodate a big group. We hosted a brunch for about 25 people without any problems. We were part of a big wedding party and everyone who came to visit us at our villa wished they were the ones staying there! The staff take care of everything from swapping a light bulb to shopping for beverages and ice. We also very much appreciated the owner's prompt replies by email to every question we had before arriving. If we ever come back to Sayulita this is definitely the place we will stay!! Thank you Claudia, Araceli, Pepe and Marcos! For wire transfers to Mexico or PayPal transfers, the account holder names would be either Marcos Scott Bravo or Liliana Perez Hernandez. ASK ABOUT LAST MINUTE DEALS! Marcos Scott has been a Sayulita resident since 1987. He was one of the first to develop the North Side and he has built 5 homes in that part of town including El Palacio and Casa Milagros. He has been very active in Sayulita community affairs for many years and was one of the founders of Grupo Pro Sayulita, a civic association working to make Sayulita a cleaner, safer, better place to live and visit. He is presently the President of the Pueblo Magico committee. Marcos and his wife Lili opened the first folk art gallery in Sayulita, “La Hamaca”, in 1997. It boasts one of the best selections of Mexican folk art and textiles in Mexico.